Derbyshire is a 300-acre community that began in 2007. If you were in real estate during that time, you know it was probably one of the worst times in history to start a master planned community. Fortunately, we have weathered the storm quite well and have managed to continue as one of the few residential developments in the area who are still in business, and thriving, with our original ownership group and development team. Throughout the lean years, we continued to invest in our infrastructure, keep our sales office open for prospective buyers, and make connections so that people knew that we were committed to Derbyshire…no matter what. Over the past two years, as the real estate market as a whole has picked up, we’ve been really excited to watch Derbyshire start to develop into the community that we had envisioned almost seven years ago. Our community will have just under 100 homesites, and we’ve currently sold 25 of those. We now have 7 houses in the community with 3 more scheduled to break ground by the end of the year. Derbyshire home range in price from $350,000 to $2,000,000 with two distinct sections of the community to choose from. 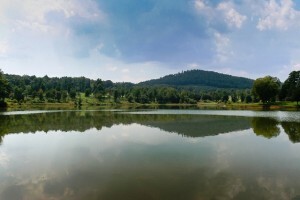 We have a private 33 acre spring fed lake in the center of Derbyshire that is fully stocked and perfect for fishing, swimming or boating. As far as infrastructure, our community is gated with paved, private roads. All utilities are underground and include electric, natural gas, city water, and high speed fiber optic cable (phone, internet, and television services). Our community trail system (for walking, biking, and horses) has been completed around the perimeter of the property and is over 3.5 miles long. Our horse trails directly connect to over 165 miles of deeded equestrian riding trails. 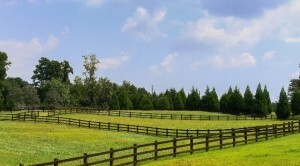 We have a state-of-the-art community stable for the exclusive use of Derbyshire residents. Over the next year we plan to begin phasing in our community center, with the covered pavilion coming first. We plan to have all components of the community center (pier, fitness facility and indoor gathering space) in place within the next two years. Essentially, we’ve spent the past several years making sure that our community was ready and poised to succeed once people were ready to buy again. If you or your clients have any additional questions that we could answer for you, please let us know! If you would like to refer a client, you can click here to fill out our referral form (or request a hardcopy to fill in), or you can contact us at 828.863.2660 or info@DerbyshireNC.com.